The following article on the Reagan Doctrine an excerpt from Lee Edwards and Elizabeth Edwards Spalding’s book A Brief History of the Cold War It is available to order now at Amazon and Barnes & Noble. Ronald Reagan would permanently change the global picture, which looked bleak when he took office in 1981. From martial law in Poland imposed by the communist regime and the Soviet invasion of Afghanistan to the Sandinista revolution in Nicaragua and communist rule in Mozambique and Angola, Soviet Premier Leonid Brezhnev claimed victories for Marxism-Leninism. Within a few years he developed the “Reagan Doctrine,” a pro-active foreign policy. Within the free world, the Atlantic alliance was strained. To counter the deployment in the late 1970s of Soviet SS-20 intermediate-range nuclear missiles aimed at major European cities, NATO proposed a dual-track approach—negotiations to remove the missiles and the deployment of U.S. Pershing II and cruise missiles aimed at Soviet cities. The latter sparked a popular movement in Western Europe, aided and abetted by the Kremlin, to freeze NATO’s deployment of nuclear weapons, and Western European governments wavered in their resolve to counter the Soviets, even on their own soil. Reagan put the deployment of the Euromissiles at the center of his new foreign policy. He forged a close friendship with British Prime Minister Margaret Thatcher and sought the support of other Western European leaders, particularly Chancellor Helmut Kohl of West Germany. Unlike the foreign policy realists who viewed all regimes through the same lens, Reagan placed regime differences at the heart of his understanding of the Cold War. With his modest Illinois roots and biblical Christian faith learned from his mother, he emerged as a screen star and a committed anticommunist, fighting communist efforts to take over the Hollywood trade unions in the postwar period. Poor eyesight kept him stateside with the army during World War II, but his varied experiences contributed to his appreciation of the need for military strength. Two terms as a Republican governor of California confirmed his conservative, pro-freedom political views. Reagan considered communism to be a disease and regarded the Soviet government as illegitimate. Like Truman, he believed Soviet foreign policy to be offensive by its very nature, and he saw the world as engaged in an ideological struggle between communism and liberal democracy. But unlike Truman, he sought in the circumstances of the 1980s not merely to contain the USSR but to defeat it. Reagan had endorsed the strategy and insights of NSC 68 shortly after that key document of the Truman administration was declassified and published in 1975, devoting several of his radio commentaries to it. Also in the 1970s, he called for reductions, not limitations, in U.S. and Soviet armaments through verifiable agreements. He identified as central weaknesses of the Soviet bloc the denial of religious freedom and the inability to provide consumer goods. He stressed that Pope John Paul II’s trip to Poland in 1979 revealed that communist atheism— ruthlessly imposed for decades—had failed to stop the people from believing in God. Reagan noted the pope’s language—“Do not be afraid!”—and the size of the crowds at the masses that he celebrated in Krakow, Warsaw, and other Polish cities. In Krakow, the pope’s home city, between two and three million people welcomed him, the largest public gathering in the nation’s history. All these policy positions formed a main theme of Reagan’s 1980 presidential campaign: real peace would come through the military strength of the West along with its political and economic freedom. For Reagan, as for Truman, the gravest threat to the United States and the free world came from the Soviet Union, whose continuing imperialist designs on every continent demanded a new Cold War strategy. A subset of the strategy for defeating the USSR was the “Reagan Doctrine,” a term coined by the columnist Charles Krauthammer, which departed from the previous policy of containment by seeking to oust communist regimes. It approved U.S. support of pro-freedom forces in Afghanistan, Nicaragua, Angola, and Cambodia. To his credit, President Carter had begun helping the anti-Soviet mujahideen in Afghanistan during his final months in office. But a key Reagan decision was to supply Stinger ground-to-air missiles, which the mujahideen promptly used to shoot down the Soviet helicopters that had kept them on the defensive for years. In Latin America, the Sandinistas were not only establishing a Leninist state in Nicaragua but supporting communist guerrillas in El Salvador and elsewhere. The Reagan administration directed the CIA to form an antiSandinista movement—the Contras—and asked Congress to approve funds for them. Reagan never contemplated sending U.S. troops to Nicaragua. He believed that with sufficient military support and firm diplomatic negotiation, Nicaraguans could rid themselves of the Marxist regime. He was proved correct by the results of the democratic elections of February 1990, when the anti-Sandinista Violeta Chamorro decisively defeated the Sandinista commandante Daniel Ortega for president. With people, funds, and weapons, the Reagan Doctrine pushed containment to its logical conclusion by helping those who wanted to win their freedom. The doctrine was part of Reagan’s overarching strategy to pressure the Soviets at their political, economic, military, and moral weak spots, build up Western strength, and press for victories on key Cold War battlefields. This article is part of our larger collection of resources on the Cold War. 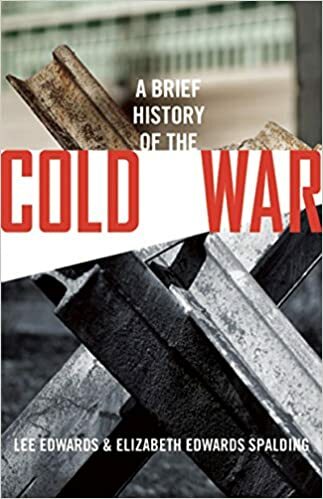 For a comprehensive outline of the origins, key events, and conclusion of the Cold War, click here. This article on the Reagan Doctrine is an excerpt from Lee Edwards and Elizabeth Edwards Spalding’s book A Brief History of the Cold War. It is available to order now at Amazon and Barnes & Noble.